Cold Spring Harbor, NY — Some cellular proteins have multiple, and occasionally opposing, functions. Professor Adrian Krainer and colleagues at Cold Spring Harbor Laboratory demonstrate in a paper published online today in Molecular Cell that the oncogenic protein SRSF1 can also trigger a stop in cell growth and prevent cancerous proliferation by stabilizing p53, the powerful tumor-suppressor protein. SRSF1 is a protein with many jobs. It was first described as necessary for the process in which mRNA, the messenger molecule transcribed from DNA to act as the template by which proteins are made, is cut and pasted into different genetic arrangements. This is known as “splicing.” It has also been shown to be involved in many other processes relating to RNA metabolism. Krainer’s group has also previously implicated SRSF1 in cancer. They showed that when overexpressed in immortal fibroblast or epithelial cells it drives transformation and causes them to grow in a cancerous manner—known as oncogenic proliferation. It is also expressed at markedly high levels in various tumors, including lung and breast cancer. In normal cells the protein MDM2 binds and marks p53 for degradation by the addition of ubiquitin (Ub). This results in normal cell proliferation. 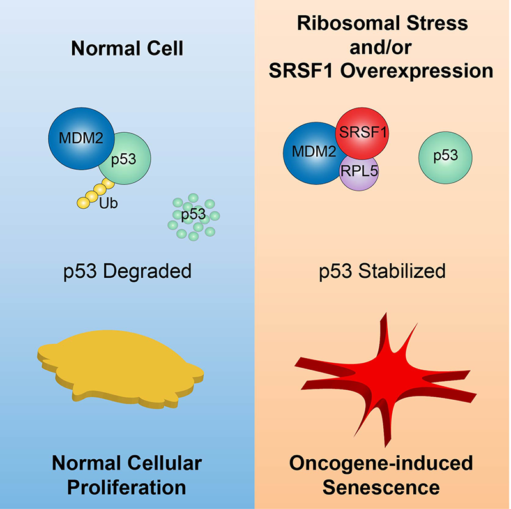 In cells that are responding to ribosomal stress, or in which the splicing factor and oncoprotein SRSF1 is overexpressed, SRSF1 binds to the ribosomal protein RPL5 in a complex with MDM2, preventing the degradation of p53. This leads to a program of oncogene induced senescence (OIS), or cell-growth arrest. SRSF1 has also been shown to shuttle in and out of the cell’s nucleus. This suggests it is involved in various processes that occur in either nuclear or cytoplasmic compartments. To investigate the diverse roles of SRSF1, a former graduate student in the Krainer lab, Oliver Fregoso (now a postdoc at the Fred Hutchinson Cancer Research Center in Seattle) initiated a study to look for other proteins that SRSF1 interacts with. While he got lots of “hits,” the key to the puzzle was to separate the signal from noise, i.e., to determine what was a real interaction and what wasn’t. Further investigation revealed that a protein called RPL5 interacted specifically with SRSF1. RPL5 forms part of the ribosome, a large complex of RNAs and proteins responsible for the translation of mRNA into the amino-acid chains that make proteins. More recently, Dr. Fregoso, together with graduate student Shipra Das in Krainer’s lab found that SRSF1 interacts with RPL5 as part of a complex that is not involved in their respective roles in splicing or the ribosome. They showed that this complex prevents the degradation of the powerful tumor-suppressor protein p53. 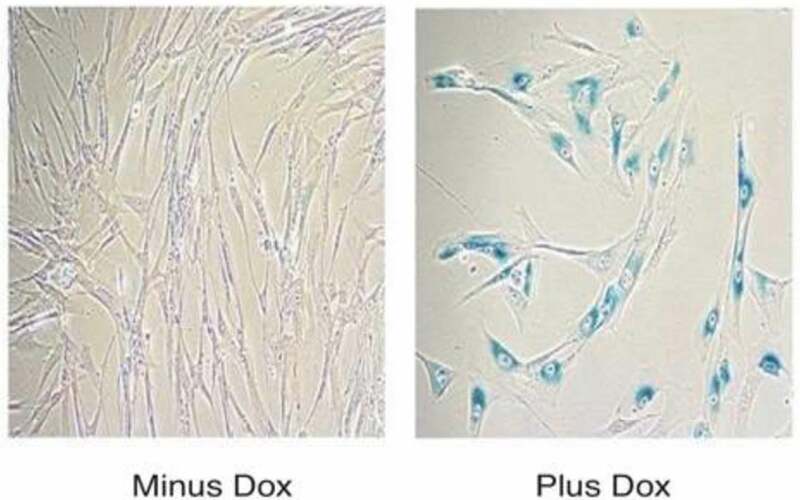 Yet Krainer’s team also showed that increased expression of SRSF1 in primary human fibroblast cells decreased their proliferation and triggered a cellular senescence program in which cell growth is arrested. “It’s a little surprising because we’ve published about SRSF1 being oncogenic, and here we find it stabilizing a tumor-suppressor protein,” Krainer acknowledged. “But this seems to be a theme with oncogenes: the cells try to respond to their activity by undergoing senescence,” a quiescent state in which cells don’t replicate. The process of cell-cycle arrest in response to oncogenic stress is known as oncogene induced senescence (OIS) and was described at CSHL by Scott Lowe’s laboratory in 1997. That discovery was the first indication that normal cells have a mechanism in place that acts to prevent transformation into a cancer cell. Through the interaction of the splicing protein SRSF1 and the ribosomal protein RLP5 Krainer’s new research also identifies a link between oncogenic stress and the ribosomal stress response. This was found to result in the activation of p53 and cell-growth arrest. “We’ve identified a novel mechanism by which the oncoprotein SRSF1 keeps a check on its own aberrant activity,” noted Das. 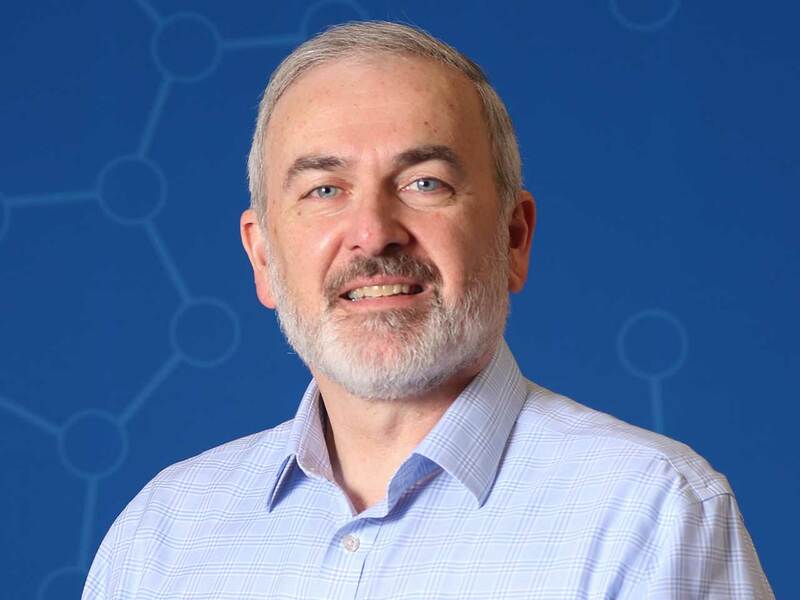 “The discovery of this novel role for SRSF1 enhances our understanding of how tumors arise and the pathways to transformation,” added Krainer. The research described in this release was supported by the following grants and funding agencies: O.F. was supported by the Hearst Foundation and the Seraph Foundation. This work was funded by grant CA13106 from the National Cancer Institute and by the St. Giles Foundation.